For dinner tonight I made a Mac and Cheese bar! I used quinoa pasta for the "mac" and daiya cheddar, earth balance, and homemade almond milk for the "cheese." The toppings were tomatoes, green beans, broccolini, corn, jalapeños, mushrooms and onions, franks red hot sauce, siracha, and sun dried tomatoes. 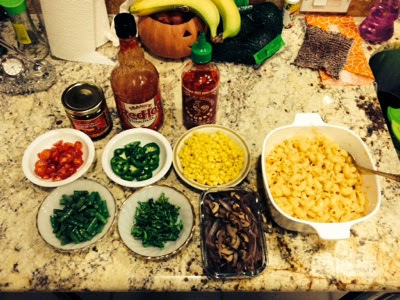 It was delicious and fun to top the Mac and cheese with various things and each person got to choose what they wanted.